A US Navy official says two US Navy destroyers, the USS Mustin (picture) and USS Benfold, have sailed through the Taiwan Strait. A spokesman called the passage of the ships, "a routine transit." 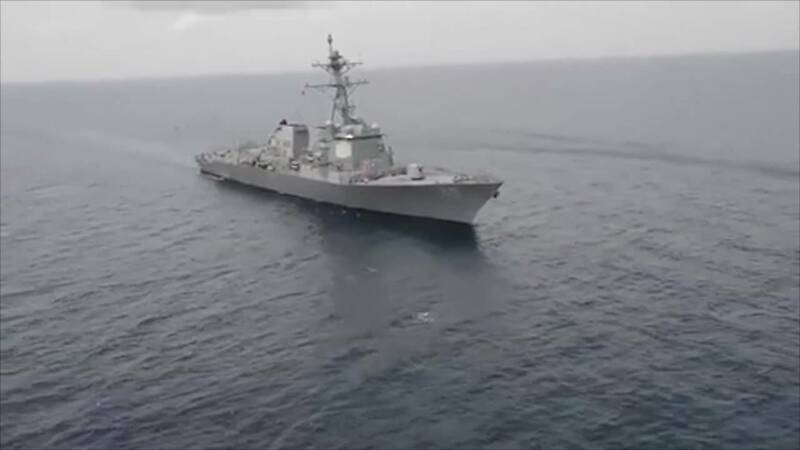 (CNN) - In a move that could heighten tensions between Washington and Beijing, two US Navy destroyers have sailed through the Taiwan Strait, a US Navy official has confirmed to CNN. The warships, the USS Mustin and USS Benfold, headed north, the official said, and are the first American warships to pass through the strait since July 2017, when the USS John S. McCain made the transit. The move, which several news outlets have reported, comes amid increasing strain between the Trump administration and China over trade, North Korea and the South China Sea. Pacific Fleet spokesman Capt. Charlie Brown called the passage of the ships "a routine transit." Beijing is perceived as sensitive to US military vessels traveling through the strait and continues to lay claim to Taiwan, a self-governed, democratic island, which it views as a breakaway province. The US Navy has not sailed an aircraft carrier in that area since 2007. China has boosted its own military presence in the region, sailing its own aircraft carrier through the strait in January. The Chinese military also recently conducted a large-scale military exercises that analysts saw as a warning over growing ties between the United States and Taiwan. Although both Beijing and Taipei view the island as part of "China" -- a term open to each side's interpretation -- neither government recognizes the legitimacy of the opposing side. President Donald Trump made headlines when he became the first American president-elect to accept a congratulatory phone call from Taiwanese President Tsai Ing-wen. The US also continues to sell advanced weapons to Taiwan to aid in its defense as part of the requirements under the Taiwan Relations Act, actions that are met with condemnation from Beijing.